Click on the contact button below, email or contact the office and we would be glad to answer your questions. We are a ministry that reaches out to infants - 6th grade. 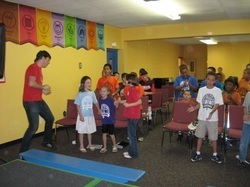 Our children's program is a vital part of our Church ministry. Kidz Klub is an excellent way for your child to learn the Bible. Our curriculum walks through the Bible on a regular basis. Our dedicated volunteer teachers give of their time and talent to provide lessons, incentives, follow-up and fun for the children. If you would like more information about Kidz Klub, press the contact button above and shoot us an email or give us a call. Children’s Bible Quizzing is a Bible study for children K – 6th grades. It is important to help them know what the Bible says and how to demonstrate biblical teachings in actual life situations. The goal of Children’s Bible Quizzing is for children to know the God of the Bible. This year we are studying Genesis. We are learning about the birth and growth of the Christian faith and the first Christian communities. Ferguson Church of the Nazarene.